We have been mining the Pikes Peak granite pegmatites for nearly forty years. What follows is a brief description of the nature of pockets and types of minerals encountered based on our experiences. Most “pockets” are small and nearly always collapsed. We mine at a deeper depth than from what most specimens are recovered and occasionally get some intact pockets. Pockets most likely to be intact are the small gas pockets about the size of a grapefruit. Otherwise, in the last stages of crystallization, virtually all pockets rupture inwardly, damaging most of the crystals. After rupture, recrystallization can begin, particularly on smoky quartz which causes overgrowth and “partially healed” crystals. Generally, all contents of a pocket are jumbled together in pieces. Contents are almost always coated with iron oxides, some very heavy and difficult to remove. We spend many hours cleaning and trying to reassemble groups, but this is often nonproductive and we end up with single amazonite and smoky quartz crystals. Pockets are classified by the predominant minerals found. Of 100 pockets found, approximately 55 will be common microcline pockets, 18 will be amazonite of varying shades of blue-green, 16 will be smoky quartz, 10 will be combination smoky quartz and common microcline, and 1 will be combination amazonite and smoky quartz. Of the same 100 pockets, about 30 will have matrix pieces, the other pockets entirely being loose, single crystals and shards. To find a pocket with good quality amazonite and smoky quartz crystals intact is rare. Mineral species include microcline, amazonite (blue-green variety of microcline), smoky quartz (some colorless, milky, and rare amethyst quartz), goethite, hematite, cleavelandite (platy variety of albite), fluorite, and zinnwaldite mica. Very rarely, topaz and phenakite are found. Some quartz is also heavily included with goethite which is locally called onegite (not a valid species, but very beautiful specimens nevertheless). Goethite often replaces siderite and forms attractive black rhombs on microcline or smoky quartz. Minor minerals, often in micro crystals, include columbite, euxenite, samarskite, cassiterite, xenotime, monazite, rutile, and schorl. Other minerals have been found. Choice blue-green crystals of amazonite have come from this location for over 100 years. Most collectors have at least one amazonite crystal in their collections, but most collectors disregard the wide variety of collectable amazonite specimens. Amazonite can be collected based on size, color, twinning, groups, and combination with other minerals. Average size of an amazonite crystal is about an inch. Crystals less than a quarter of an inch are rare, micros are nearly impossible to find. Good euhedral crystals larger than four inches are also very rare. (Many pieces are larger, but euhedral crystals aren’t). Hue which is the richness of color, and shade which is the lightness to darkness, are the two components of color. Microcline other than a definite blue or blue green color cannot be classified as amazonite. Therefore on a 1 to 10 scale of color, amazonite with a 1 color is very light but with definable blue or blue-green hue. A 10 would represent the most vivid blue-green hue possible with medium-dark body color and no muddiness (too dark or mixed with other body colors). A 5 is medium light with good amazonite hue and representative of average material. Most good colored amazonite is a 5 or 6. Good crystal shape should show sharp pinnacoids (termination faces) and have longer prisms (sides) than diameter of crystal (longer is better). Since most amazonite crystallizes “laying down and sideways,” tall, euhedral crystals, even though single, are quite rare. Crystal Peak amazonites generally have a satiny luster, though many may appear quite dull. Occasionally, adularescence will be attractive. Twinning in amazonite crystals is relatively rare. Manebach twins seem to be the most common and depending on the twinning plane, a large variation in manebach appearances can occur. Some appear as a single crystal with no “notch” whereas others appear as “chevrons” or “butterflies” depending on the length of the twinning plane. Most manebachs are repaired because they naturally separate on the weak twinning plane. Carlsbads seem to be next in occurrence, with some very sharply divided halves. The rarest twin is the baveno with true euhedral crystals being extremely rare. Most are subhedral. Amazonite can also display intercrystallization of orthoclase (not albite as earlier studies indicated) which, when selective, appears as white caps on the pinacoids and sometimes white stripes on the sides of the crystal prisms. Most amazonites will show a very slight white-striping. Pronounced stripes and caps with sharp definition and thickness are rare. Occasionally, amazonite will show a mottling of white and blue, the white being orthoclase which is not ordered in the crystal form. These are an attractive variation if the blue is strong. Groups of amazonite crystals are quite rare and are highly sought. Combinations with other minerals are even more highly sought, but increasingly rare. Combinations with cleavelandite are more common than with smoky quartz. Sometimes amazonite clusters will occur with fluorite cubes, generally pale purple or green, and with goethite sprays. All combinations are rare and highly collectable. As you can see, if a collection contains just one amazonite, it is sadly lacking representation of the wide variety of amazonite specimens. This is similar to limiting a collection to just one quartz specimen. Just as there is a huge variety in the amazonites recovered, there is also a huge variety found in the smoky quartz crystals. Size ranges from less than one inch to monsters weighing thirty or more pounds ranging up to twenty inches. An average smoky is two to three inches long by about in inch in diameter although many exceed this. The most common twinning is the dauphine, although it is usually overlooked. Terminations range from simple to complex. Most attractive seems to be the “rockets” in which the crystal gently tappers down to a sharp and even point. All six sides begin sharply defined and nearly equal, three of the prisms gradually taper down to nothing and then the remaining three sides taper down to a sharp “pencil” point. Other terminations show the chisel shape. Most interesting shapes of smoky quartz occur from recrystallization after a pocket ruptures. Often the secondary crystallization is colorless or milky, giving rise to ghosts or phantoms. Some milky quartz forms pronounced caps on the smokies. Secondary crystallization also creates scepters, though these are rare from the Crystal Peak area. Double terminated crystals are often rehealed crystals, which “grow” a second termination. Many shards from ruptured pockets recrystallize into interesting groups and flattened crystals. Color can vary from very light to intense black. Most smokies appear dark black, but a good light shows them to be a rootbeer bottle brown, not a gray. Rich, red browns make the best cut gems. However, some black smokies are indeed totally opaque black. The highest sought smokies have a transparent, light-brown color. Luster varies widely but tends to be a satiny finish. This creates a dull look to most of the smokies, but also enhances the black color and when in combination with blue-green amazonites, creates the strongest contrast. Smokies with a glassy luster are very rare. If a crystal does have glassy luster, it is usually selective on two or three sides, the rest remaining satiny. Single smoky quartz crystals are common. Clusters of just smoky quartz do not exist except as small druse coverings on microcline or other smoky quartz. Some combination specimens have such minor microcline that they do appear as a solid cluster of smoky quartz, but inspection will show the intermixed matrix. Nevertheless, a huge variation occurs with the smoky quartz and many collectors overlook the possibilities for their single crystal collections. All these quartz varieties occur in the Crystal Peak pegmatites. Most people believe the colorless crystals have been smoky at one time and have faded to colorless upon exposure to ultraviolet light. I have frequently found the secondary quartz covering the original smoky quartz crystals is colorless. This sometimes creates smoky phantoms, though usuually not sharply zoned, inside the quartz crystal. Citrine quartz occurs as small crystals up to 1/2 inch usually associated with goethite. Often what appears to be citrine is smoky quartz included with either rutile or goethite. Amethyst can occur as large attractive crystals of very dark color. In this case, portions of the crystal are generally smoky as well. The distinct amethyst crystals occur with goethite. These are most ofent included with goethite and are up to 1/2 inch max. Very rarely is any amethyst of gem quality. Good amazonite with smoky quartz combination specimens are amongst the rarest of all classic collectable mineral specimens and each year’s production is scanty at best, often only resulting in a half dozen specimens of good quality. Most often when a rare combination pocket is encountered, the quality of only one of the two minerals is good; size of one overshadows the size of the other; color of one is good, but not the other; condition of one is good, but not the other; number of crystals of one overshadows the number of the other; and the list goes on. On average, out of the pockets encountered, less than one percent have both amazonite and smoky quartz in combination and then of this one percent only about five percent are of good show quality. Virtually all pockets rupture in the last stages of crystallization which causes severe damage to the pocket contents. Crystals are not only chipped but normally are found separated and as loose crystals of smoky quartz and amazonite. The amazonite and smoky quartz do not crystallize on a host rock as do most collectable specimens. Both intertwine and compose the matrix. As a result, they naturally separate along the crystal faces. Over ninety percent of all collector specimens are repaired, most often, crystals are simply reattached. Often even this is not possible in the case of smoky quartz because recrystallization has taken place and attachment leaves a gap. Occasionally some damaged areas are reconstructed in which missing tips or holes are filled. A great specimen consists of the best of the features of both minerals in combination. Here balance, aesthetics of placement of crystals, size of matrix, etc. also come into play in determining a high quality piece. Thumbnail specimens are rare. The largest groups recovered are about a foot square. As a result, there probably exists no other classic combination which is harder to get a good quality piece which is one reason the value of these specimens is so great. Even museums lack good quality combos. The bulk of all crystals recovered are tan, white, or reddish brown microcline. Excellent crystals of all habits and sizes occur. Unfortunately good crystals are highly underrated by collectors except for the study of crystal habits and shapes. Microcline occurs in all the variations and combinations as does amazonite. Good, tall single euhedral microclines are not as common as people believe as they also tend to crystallize laying down and in contact with other microclines. Small groups are probably more common than nice long single crystals. Some crystals display an attractive satiny sheen (adularescence) that “rolls” across the specimen when turned in the light. In addition to the twins, microcline can occur in parallel curved crystals, small oriented stepped crystals, and other unusual and rare formations. White microcline groups are attractive, especially with contrasting smoky quartz. These groups are also uncommon in good, aesthetic pieces. Generally the cleavelandite crystallizes on the sides of amazonite and smoky quartz so single species specimens are uncommon. The plates of albite tend to be very thin and compact and often are heavily stained due to iron oxides getting between the plates. Snowy white rosettes and cushions of cleavelandite are the most desirable. Some amazonites nested in cleavelandite are stunning because of the sharp blue and white contrasts. Fluorite occurs as large, rough shaped cubes generally detached from matrix. Nearly all the specimens are etched from the nature of pegmatite pockets. Their luster is dull to satiny but a few with lustrous faces have been recovered. Most of the crystals are very pale, almost white. When colored, dark, almost black, purple tends to be the most predominant color, followed by green. Some cubes show color zoning and some have each corner with cubes crystallized on them. Size varies from about a quarter of an inch to two to three inch cubes. Larger ones do occur but crystal shape is usually very rough. Most desirable specimens occur on matrix and are very rare. Occasionally a fluorite will be perched on a smoky quartz crystal. Good fluorite specimens from the Crystal Peak area are hard to come by. Spectacular specimens of goethite are recovered. However, most goethite is badly damaged, roughly crystallized brown or black masses found in the pocket cavity and can be quite common. In many cases, it creates problems in cleaning other specimens. Goethite sometimes replaces siderite creating nice rhombic pseudomorphs. Often too much limonite accompanies this replacement so the specimens cannot be safely cleaned and therefore, they remain unattractive. Sharp, black, or silvery rhombs are rare and very attractive. These can be perched on the sides of smokies as well as on top of amazonites or microclines. Rhombs can measure up to about an inch. Goethite also forms as an inclusion in smoky quartz, nearly like golden rutile needles. These specimens of goethite and quartz, locally called onegite, are often weird but attractive. 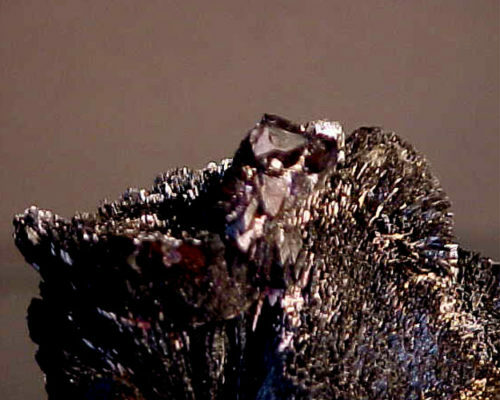 The large goethite sprays of dark metallic luster or silvery luster are the most highly sought. Difficult to clean, since the individual crystals are like flattened needles, goethite forms into spectacular sprays up to six or more inches in attractive patterns. Large sprays are rare on matrix, but smaller sprays can cover matrix in a forest of goethite “bushes”. Very few collections display a fine goethite spray. Topaz is rarely encountered in the Crystal Peak area. Usually it is in small fragments from broken crystals and is crudely formed. Due to its perfect basal cleavage, it is almost always detached from matrix. The best crystals are usually colorless, light blue, or light sherry color, and measure up to an inch in size. Terminations can be simple or complex, with the latter being the most desirable. Very rarely, topaz will be found crystallized on quartz or microcline. Presently, Glacier Peak has crystals of different nature from the Tarryall Mountains to the north of Crystal Peak. Zinnwaldite is the most prevalent mica. It is generally very dark, almost black, but it exhibits bright gold to reddish gold surfaces when held in the light. Most collectors mistake it for biotite; however, the lithium content causes it to be classified as a distinct species. Nearly all zinnwaldite is subhedral, in that it is discovered encased in quartz or microcline. The crystal habit is monoclinic and it forms elongated hexagonal “books” somewhat barrel-shaped like corundum. Most specimens offered are hexagonal sections off these long crystals. Natural, complete crystals are quite ugly. However, the thin cross sections are beautiful and often display interesting zoning when held up to the light. Numerous other minerals occur in small, nondescript examples. Some micro crystals are suitable for micromounting, however. These species include: phenakite, euxenite, samarskite, columbite-tantalite, cassiterite, limonite replacing pyrite, rutile (yellow, micro sprays of matted needles), and xenotime.